We're all about new beginnings here, especially when they involve getting rid of things that aren't working to make space for things that do. That's why we love the whole idea of "spring cleaning": de-cluttering our home, making things more efficient and taking some time to reevaluate how things operate in our space. Here are some of the things we're planning on doing to refresh our home and shop this season. Clear out the things you don't need. You know that book everyone always talks about? Well, you don't have to read it in order to get the idea: the Japanese are on to something when it comes to clearing out the unnecessary clutter in your life. We're looking forward to going through our belongings, asking ourselves if they still have value and donating the things that don't. Tackle those little projects. Whether you own your house or you rent, there are always little home improvement projects that pile up. From installing a new clothing rack in a closet to an entire bathroom renovation, now is a great time to set aside some time (and money) to get those reno jobs done. Prep your outdoor space. If you're anything like us, you think every hangout is more fun if it's outside. We're planning on making this the year that we finally make our patio a place for a few drinks with friends by adding some furniture, incorporating outdoor lighting and brightening it up with lots of plants. Switch out your linens. This one is pretty specific, but we love the idea of switching out heavy winter bedding and shabby towels with light linens for the warmer seasons. Make the most of your windows. Now that the days are longer and the temperatures are warmer, you'll likely be using your windows a lot more. Give them a thorough wash inside and out to clean off any winter debris, then trade in any heavy window treatments for light, white curtains or blinds that you can easily pull away. Being that a big bulk of our art pieces are meant to hang on a wall, we get asked a lot about how to hang them. Many of our customers live in rental homes or apartments, and in those cases, the heavy-duty nails required to hang some of our heavier wooden pieces just won't fly. In a perfect world, you would be able to hang the art you want to in your home and still get your security deposit back — and we're here to help you do just that. Try the lean method. Many interior designers and savvy renters simply lean their larger art pieces against the wall rather than actually hanging them. This works best with a shelf or some type of surface (a la this scene from The Stella Blue Gallery above), but if you're working with a really big piece, it also looks cool and carefree to simply tilt it against the wall while resting the bottom on the floor. Get smart about your hooks. If you're able to make a few holes in the wall and you're just looking to limit the extent of the damage (and your eventual workload when you move out), try using monkey hooks in place of regular nails. These J-shaped hooks can hold up to 50 pounds if you use them the right way, so they're perfect for hanging even our larger pieces. Create a mantle display. If you're lucky enough to have a fireplace in your rental, our pieces look great when displayed on the mantle. Mix them with plants, picture frames and other decorative objects to create a designer-worthy vignette. Try Velcro strips. While these little guys aren't quite sturdy enough for our larger pieces, they would work to hang pieces like the Shelby or the Trinity. Plus, they're easy to remove from the back of the piece, so you can easily take it with you if you move. Think outside the wall. If you just can't risk your security deposit but you still want to display a 1767 piece in your home, check out our serving trays or tables instead. These feature the same reclaimed wood construction and signature designs as our wall art pieces, but they don't require any nails, screws or even tape to incorporate them into your decor. Since the only thing we have on our minds this week is our Showroom Opening Party on Saturday, we figured we'd share a few of our favorite party-planning tips with all of you. Now, this has nothing to do with etiquette and everything to do with atmosphere — from creating a cozy, welcoming space to filling our guests up with our favorite foods, these tips are all about making people happy. Enjoy! Set the scene. Whether you're throwing a bash in your backyard or renting out a space, we're big believers in always adding your own touch. 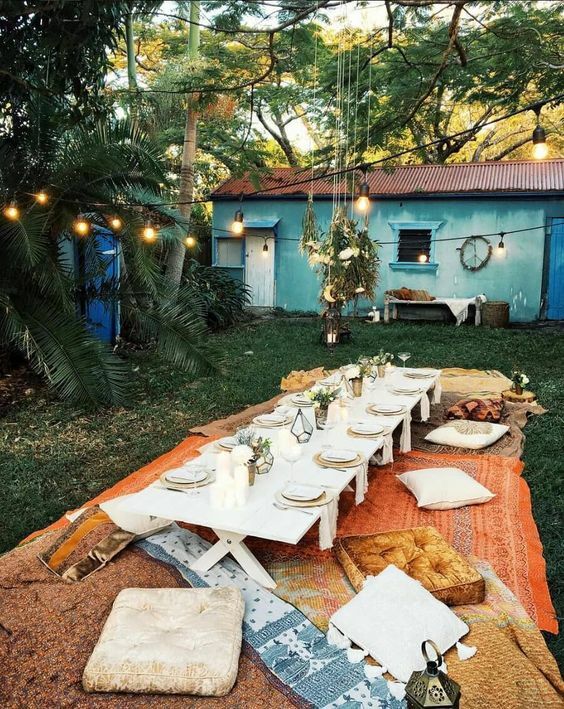 Outdoors, you can scatter some vintage rugs on the ground for instant seating, add some string lights for a bit of ambiance and even set out a few games (bocce ball, anyone?). Inside, you can hang some paper lanterns, light your favorite candles and add some additional seating with pillows on the floor. PS: our serving trays make great party accessories! Add some music. Since we live in Nashville, we're lucky enough to have a musician (or two... or three...) at just about every party. While an acoustic guitar and a mandolin are great party entertainment if you have people who know how to use them, you can get just as much out of a stack of records and a record player. Plan the menu. We love eating, and we're not stingy with our food. We love making big batches of tacos, grilling up carne asada or setting out heaping bowls of homemade guac for our guests. No matter what you serve, be sure to order plenty for the whole group — too much is always better than not enough. Provide some entertainment. We love playing games, especially board games and ping pong. While some games are great as the focal point of a party (such as volleyball at a barbecue or charades at a game night gathering), things like cards or horseshoes are great back-ups if things start to get dull. Now that you know how we like to get down, we hope to see you on Saturday at our Showroom Opening Party! You can expect great music, great food, and great times in our brand new space.